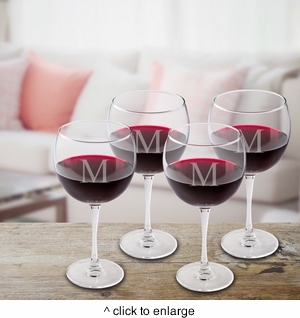 DETAILS: Our Set of 4 Personalized Red Wine Glasses are specially designed for that favorite red vintage, pleasing the wine connoisseur in your life. Attractively personalized with a classic-styled initial, these glasses are sturdy yet delicate and make a great bridesmaid or housewarming gift. Cheers! SIZE: Glasses hold 16 ounces of your favorite vintage each. PERSONALIZATION: Personalized with single initial (all will be the same). MARKETING: Barware, wine gift idea.